LP0176. 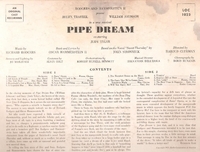 PIPE DREAM (Rodgers & Hammerstein), Based on John Steinbeck’s novel 'Sweet Thursday', Original 1955 Cast, w.Helen Traubel, William Johnson, Judy Tyler. Shaded Dog black label RCA LOC-1023.